The Game Master's Kit is the perfect accessory for fans of the Dragon Age RPG. This handy product features a three-panel hardback screen that puts all the essential game info right in front you. It also includes a 32-page adventure by Jeff Tidball that can serve as an introduction to the game or as a follow-up to the adventure in the core game. 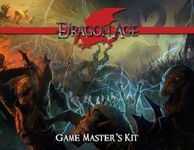 With the Game Master's Kit and Set 1 of the Dragon Age RPG, you'll be ready to kickstart your dark fantasy campaign.